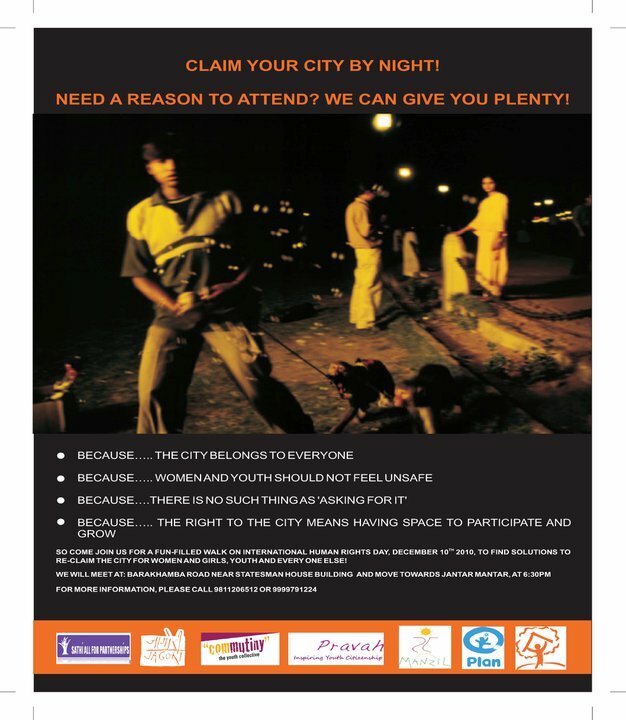 To kick off our Youth for Women and Habitat Campaign, we can think of no better way than to organize a night walk in the city. To all fun loving, equality minded Delhi youth, pass on the word and come join us on December 10th 2010 accross from Stateman House on Barakhamba Road, close to the CP inner circle. So don’t forget your Reeboks, radios, and women empowering posters! Because this is the occasion to show Delhi that the cit…y belongs to everybody, all the time. Let’s take this opportunity to discuss how women’s freedom and capabilities can be enhanced through greater access to resources and to the public space! SAFP will place youth volunteers to intern with organisations which are willing to develop plans in Delhi and elsewhere in India. Send us an email if you can volunteer one month time to work on a project. Sathi All for Partnerships (SAFP) conducts advocacy and lobbying for the rights of those disabled by mental illness and marginalized women to decent housing, property rights and equal access to livelihood resources. Jagori is a women’s training, documentation, communication and resource centre that was established in 1984 with the aim of carrying feminist consciousness to a wider audience using creative media. Manzil is a non-profit organization providing a community and resources for local youth from low-income backgrounds to learn, teach, be creative, and see the world in new ways. Youth Collective is The Youth Collective (CYC) is a group that promotes youth development in India. Its goal is to promote youth leadership for greater participation in decision making. Pravah works with young people to impact issues of social justice through youth citizenship action. Plan India works amongst the most marginalized communities in 11 states of the country promoting child rights to end child poverty.